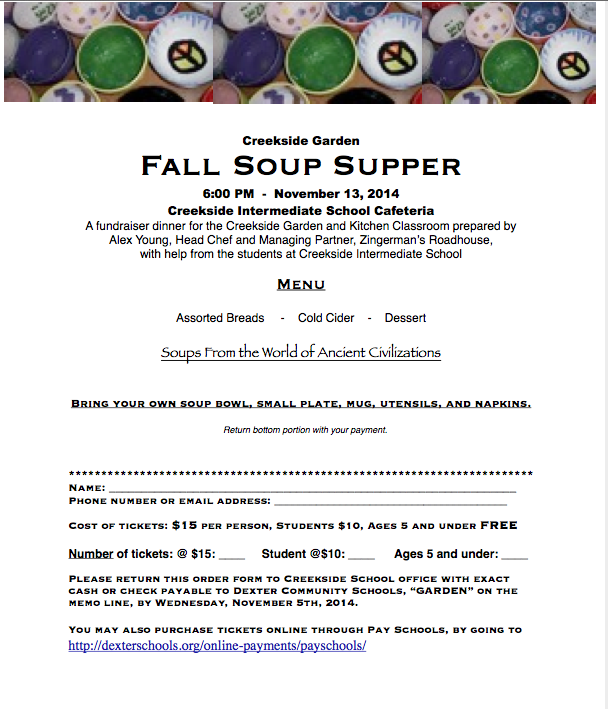 Creekside Garden – Fall Soup Supper Fundraiser! The Creekside School Garden Program has had a lasting relationship with Zingerman’s Roadhouse Chef and farmer at Cornman Farms, Alex Young, for several years. Alex will be back at Creekside again this year to offer a beautiful soup supper, and celebrate the many successes of the garden program this year. Creekside’s garden program this year has expanded the number of students impacted by creating an after school garden club in addition to the Kitchen/Garden FLEX class, which was established last year. Proceeds from the event will benefit the garden program at Creekside. See the announcement and flyer below for more information on how to join us! Please bring your own bowl, mug, small plate, silverware, napkins – we are trying to be “green”.